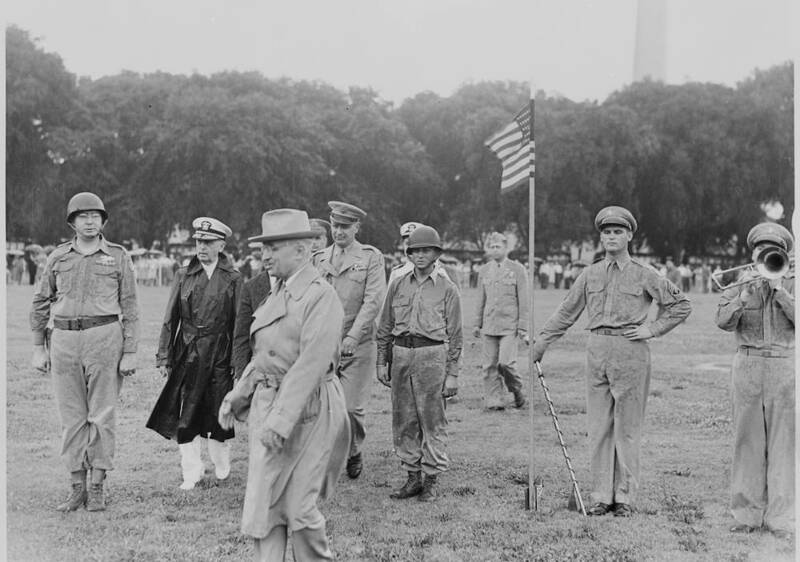 President Harry S. Truman reviews the Japanese-American 442nd Regimental Combat Team in Washington, D.C. on July 15, 1946. Photo by Abby Rowe/National Archives and Records Administration. In January 1943, President Franklin Delano Roosevelt and his War Department abruptly reversed course by allowing Japanese Americans to enlist in the U.S. Army in the fight against Germany and Japan. This was not a foregone conclusion: The draconian mass removal and incarceration of 120,000 Japanese Americans had been justified as a military necessity—and continued to be enforced. Two-thirds of those incarcerated were American-born Nisei, second-generation citizens; one-third were Issei, Japan-born immigrants, prohibited by law from applying for naturalization. In the event of an invasion by Japan, the argument went, Japanese Americans were so culturally unknowable that there could be no reliable way to determine the loyal from the potentially disloyal. There were no charges, no trials, no convictions—of espionage, of sabotage, or of anything else smacking of disloyalty. The process of forced removal and incarceration took most of the entire year, 1942. Given these presumptions and these actions, recruiting Japanese Americans—or JAs—into the military and arming them defied all logic. When the announcement for JA enlistment was issued, only 1,200 Nisei from the camps volunteered while about 10,000 Nisei from Hawai`i, where relatively few JAs had been incarcerated, answered the call. There were equal numbers of eligible Nisei on both fronts. The tribulations undergone by the mainland JAs had taken their toll on enthusiasm to enter military service. A small fraction (perhaps 10-15 percent) answered the questionnaire in ways that either protested their incarceration or cast doubt on their loyalty, or both. 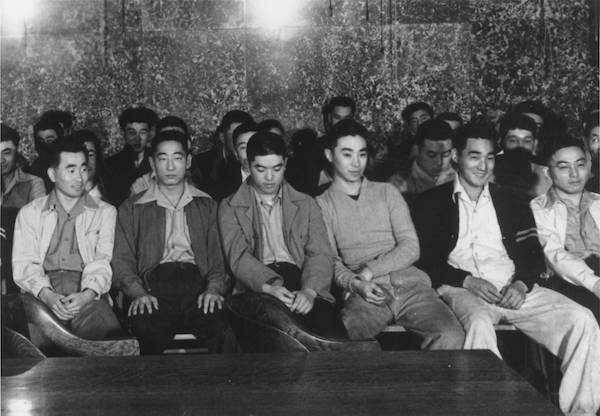 Moreover, when the draft was actually imposed on Nisei incarcerated behind barbed wire, several hundred became draft resisters, defying orders to appear for induction and facing federal courts in several states. Their motives varied from individual concerns for ill parents in camps to those who had forsaken any semblance of loyalty to the United States to those who vehemently articulated their stance as upholding principles of their Constitutional rights. Yet eventually the 442nd Regimental Combat Team became the most highly decorated unit for its size and length of service during World War II, perhaps in all of American military history. All told, 21 men were awarded Medals of Honor, an incredible record for a regiment of approximately 3,000 soldiers. Including their replacements, some 14,000 men served in the regiment during the war, nearly all of them Japanese American. Their commissioned officers, at least in the beginning, were all white. The history of the team sheds light on a 20th century American tragedy that still has resonance today. The first day of the trial of the 63 Heart Mountain draft resisters in Federal District Court, Cheyenne, Wyoming, June 12, 1944. Courtesy of Frank Abe. The 442nd only came to be after difficult deliberations within FDR’s wartime administration. By the time of the Pearl Harbor attack, the draft had already been imposed and hundreds of Japanese Americans were serving in the military. Immediately thereafter, many were discharged or forced to turn in their weapons and consigned to labor duties. Senior military and civilian officials demanded that Hawaii’s JA population be removed to mainland concentration camps. FDR himself had been calling for that drastic step but the JA community, about 160,000 strong, comprised over one-third of the Territory of Hawaii’s population. Cooler heads—including the local police, the FBI, and the Military Governor in charge of Martial Law in the Islands—prevailed by arguing that the JAs were crucial to the war effort in the Pacific. In Hawai`i, more than 1,400 JAs were in training at Schofield Barracks, close to Pearl Harbor, when their commanders learned of a major naval battle approaching near the Midway Islands, about 1,000 miles northwest of Hawai`i. The confrontation between the two major aircraft carrier groups, Japan with four and the U.S. with three, took place June 4-6, 1942. On June 5, the Hawai`i JA draftees, not yet part of any organized army unit and deemed racially unreliable, were shipped to San Francisco, in the event the battle ended badly. However, on June 6, the Battle of Midway concluded with American aircraft sinking all four Japanese carriers and with them, Japan’s ability to attack the West Coast or Hawai`i. It was a decisive victory, turning the tide of the war dramatically against Japan. But while the destiny of the war had now shifted, albeit with years of gruesome warfare ahead, prejudice and racism directed against JAs continued unabated both in the military and the federal government. In the military, the War Department order issued on January 5, 1942, declaring all JAs “4-C”—that is, aliens ineligible to serve—continued in effect throughout the year. At the same time, the forced removal and incarceration of JAs on the West Coast continued unabated, even after the Midway turning point and well into the fall. Nonetheless, the U.S. was forced to reconsider its policies, for several reasons. The government needed to open a path to eventual release of JAs incarcerated at dozens of sites, and it needed manpower to replace growing casualties in the two-front war. Protests and lawsuits from the JA communities were escalating; and a few influential individuals and groups called for an end to racist policies; among them were the perennial socialist presidential candidate Norman Thomas, a few civil rights advocates, university presidents, and the Quakers. In the war itself, propaganda played an important role and the Axis powers had been quick to exploit America’s anti-Japanese American racism to counter its claims to moral superiority. Those who passed the so-called loyalty tests joined the segregated 442nd Regimental Combat Team, as well as other units. Thousands of JAs formed the core of the Military Intelligence Service, which provided crucial Japanese language translation and interpretation; this information was vital to the prosecution of the war in the Pacific, largely because the unsuspecting Japanese military never considered the Nisei capable of “disloyalty” to the homeland of their Issei parents. Others served in the Counter Intelligence Corps, the Women’s Army Corps, and the 1399th Engineer Construction Battalion. The battlefield heroics and military valor of these Nisei may be understood through their WWII awards, an amazing record: in addition to the 21 Medals of Honor, some 29 Distinguished Service Crosses, 588 Silver Stars, more than 4,000 Bronze Stars, and over 4,000 Purple Hearts. Given these presumptions and these actions [of forced removal and incarceration], recruiting Japanese Americans—or JAs—into the military and arming them defied all logic. But the record also includes Nisei who suffered doubts about loyalty to a country that had betrayed them or who had misgivings about sacrifice in general. Some Nisei who protested discriminatory treatment were shunted into the 1800th Engineer Service Battalion and relegated to hard labor—grunt work to facilitate training maneuvers. The major postwar narrative fashioned by leaders in the JA community and mainstream media left out the more troublesome notes. The popular story featured an ethnic group beset by discrimination and racism before WWII, demonized by association with an enemy Japan after Pearl Harbor, and yet ultimately transcending unendurable conditions during the war through heroic stoicism and gallantry. Over time, that record made JAs America’s “model minority,” a community honored for bootstrap progress through quiet, dedicated, and unobtrusive diligence; this perception was built in deliberate contrast to African Americans whose struggles for civil rights involved actions designed to disrupt the status quo. This JA narrative ends, it is said, with a suitable reward: On August 10, 1988, President Ronald Reagan signed H.R. 442 (note the number), a bill apologizing for the unconstitutional treatment of JAs and providing checks in the amount of $20,000 to each of over 60,000 individuals still alive on that date. But the story is not over—far from it. After Reagan’s apology, a sea of historic markers, exhibitions, art collections, websites, documentaries, articles, videos, books, museums, monuments, and memorials has appeared. Nearly all of these markers now spread a new gospel: the racist, dehumanizing, unconstitutional, experience of Japanese Americans during WWII must never serve as justification for scapegoating any group in the name of national security. Franklin Odo is the John J. McCloy Visiting Professor at Amherst College. 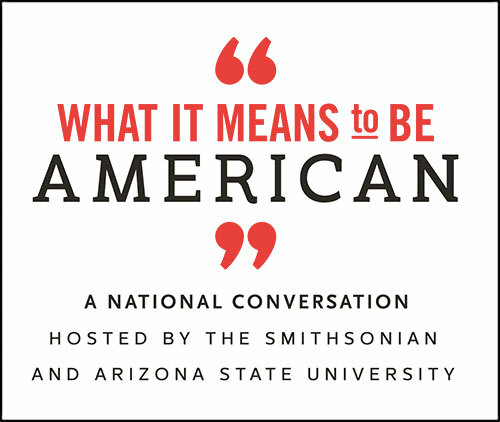 He was founding Director of the Smithsonian Institution’s Asian Pacific American Center. Primary Editor: Sara Catania. Secondary Edito: Joe Mathews.